Designed for 340-360 c.i.d. Chrysler V8s and 318 c.i.d. engines with 340-360 cylinder heads. Latest technology in dual-plane design results in both excellent low-rpm torque and outstanding high-rpm horsepower. Recommended for high-performance street, strip and fresh water marine applications. Accepts 1975 and earlier-style waterneck only. Will not accept stock Thermo-Quad carburetor. Will not fit 1992 and later Magnum engines. Manifold height: (A) 4.90'' , (B) 5.80''; Carb pad height = 5.35'' Click here to determine carburetor pad height. 1979 & later rotary A/C compressor will not clear waterneck. Designed for street high-performance applications, Performer RPM cams provide power from 1500 to 6500 rpm. These hydraulic lifter camshafts are dyno-matched to Performer RPM manifolds for high-rpm horsepower while maintaining acceptable low-end torque. With 10 to 12 inches of manifold vacuum at idle, Performer RPM cams have more lift and duration than most street camshafts. Performer RPM, Performer RPM Hydraulic Roller and Torker-Plus cams are for street high-performance and racing applications only - not for heavy vehicles. 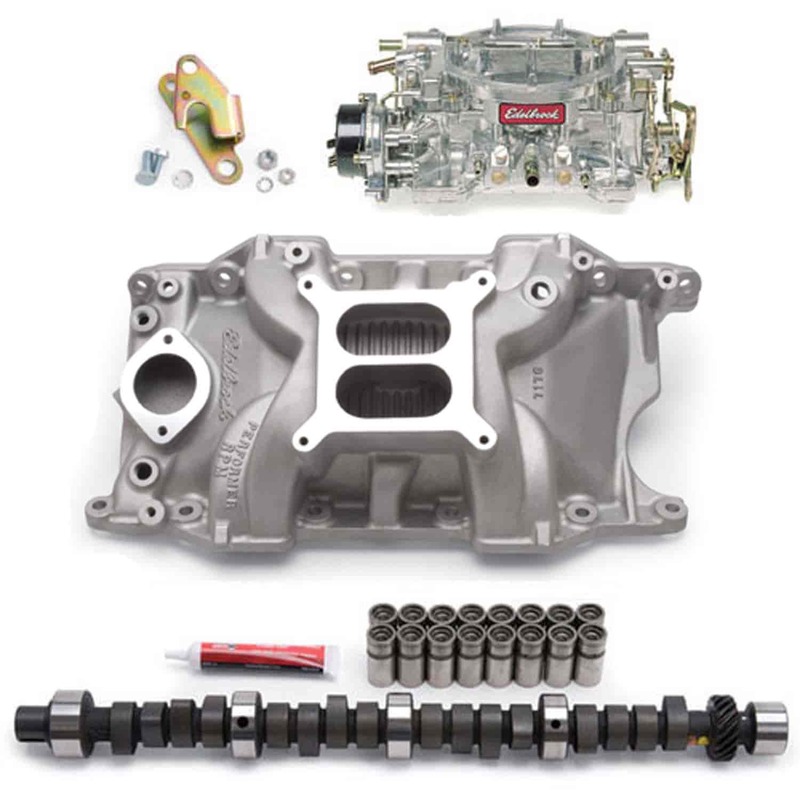 Use with Edelbrock Performer RPM heads (or other aftermarket cylinder heads), adjustable valvetrain components, screw-in studs, high-performance adjustable rocker arms and at least 9.5:1 compression ratio. Headers, high-energy ignition, lower-than-stock rear gearing and a high-performance torque converter are necessary. Note: Adjustable pushrods or rocker arms required.